Courts • Ruling suggests pair were merely "occasional roommates." Francisco Kjolseth | The Salt Lake Tribune Shannon Price, center, ex-wife of actor Gary Coleman, appears in 4th District Court in Provo on Monday, May 7, 2012, for the start of a two-day hearing over the late Coleman's estate. 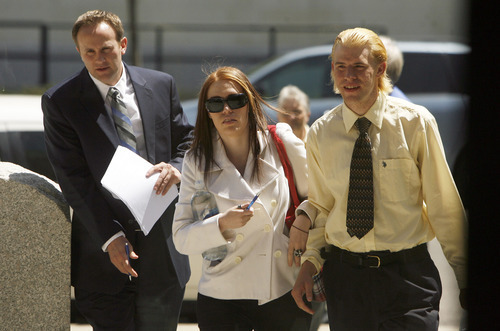 At left is Shannon's attorney Todd Bradford and her brother Sam Price. Shannon Price failed to prove that she and Gary Coleman had a common-law marriage after their 2009 divorce. Fourth District Judge James R. Taylor ruled Monday that while Price had lived in the former "Diff'rent Strokes" star's home after their marriage ended, the relationship failed to meet the state's standard for a common-law marriage. "There is simply insufficience credible evidence to conclude that they were more than occasional roommates," Taylor wrote in his 18-page decision. Attempts to contact Price's lawyers were not successful. A secretary at their Spanish Fork office said that Mitchell Maughan and Todd Bradford were both out for the day. Dale Price, Price's father, said his daughter was not available, and that the family was not aware of the ruling. Price was seeking to establish that she had a common-law marriage with Coleman, who died May 28 at 42, 2010, after a fall in his home, in order to claim Coleman's estate. But Anna Gray, Coleman's friend and CEO of his personal corporation, contended that Price's claim ended when she divorced Coleman, and that a 2005 will naming Gray as Coleman's executor is valid. Gray did not respond to messages seeking comments by deadline. In an earlier interview, Gray said there is no money left in Coleman's estate. The house was foreclosed by the bank. "What I want are his ashes, and stopping his continued mistreatment," Gray said. She also wants to ensure his name is not exploited, and is used only for projects he would have approved. Price and Gray spent two days in 4th District Court this past week arguing the issue before Taylor. Under Utah law, an unmarried couple can be considered to have entered a common-law marriage if they are old enough and legally capable of being married, live together, assume the duties and responsibilities of marriage, and gain a public reputation as a married couple. Taylor said Price failed to prove all but the fact that she and Coleman could have gotten married in Utah. While Price testified that she continued to live with Coleman after the divorce and have sexual relations with him, Taylor said she did not prove that claim. He pointed to witness testimony that Price had said the relationship was not sexual, that they had separate bedrooms and Price was barred from the house for part of 2010. "[Price] was publicly abusive to [Coleman] , engaged in an open romantic relationship with another man in the community, was prohibited from entering the home because locks were changed by court order, and has a significant self-interest in the case," Taylor wrote in his 18-page decision. Taylor also noted Price withdrew her name from the home's deed after the divorce, claiming she didn't want to be responsible for the mortgage should anything happen to Coleman, something someone who was undertaking marital responsibilities would not have done. While the couple had a joint checking account, Taylor noted that Price used her maiden name on it, with no indication that they were married. "Finally, they did virtually nothing to create a public impression of their relationship, resulting in a lack of a uniform and general reputation about their status as husband and wife," Taylor wrote in his decision.